S.O.S. Mom and Real Momma have teamed up to bring an exciting giveaway! As mom's of young kids, we're always on the lookout for unique and fun products, so when we found Bubele's Patch Buddies, we knew we had to share them with all of you! Sleepovers; send your child to a friend’s house with the backpack stuffed with everything they need to be away from home. Gifts; your child will love collecting all the plush toys to go with their new backpack, making it easy to find a new gift when their birthday or a milestone comes around. Started in 2007, Bubele's Patch Buddies is a family business that's rooted in strong values. The company was founded in a desire to help people build connections and friendships through the magic of toys. Their mission is to give people toys that bring joy and closeness to families. To order or learn more about Bubele's Patch Buddies, visit them via their website, their Facebook page, or Twitter profile. Real Momma and S.O.S. 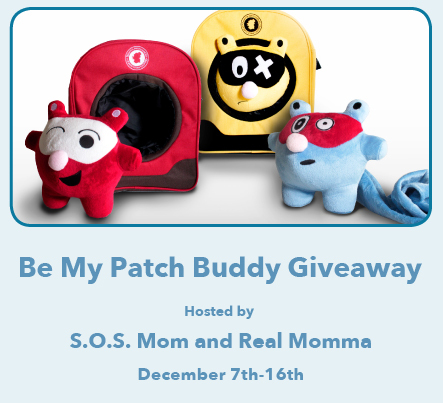 Mom would like to invite you to enter the Be My Patch Buddy Giveaway, sponsored by Bubele's Patch Buddies! One lucky reader will receive a Patch Buddies adorable combination of a plush toy and a custom backpack of their choice (a $32 value)! Giveaway will be open for entries until December 16th, inclusively, for all Canadian and US residents. A huge thank-you to co-hosts Mudpies & Tiaras, Journeys of The Zoo, Mom Does Reviews, Mama to 4 Blessings and a terrific group of bloggers that are all making this giveaway event a great success!